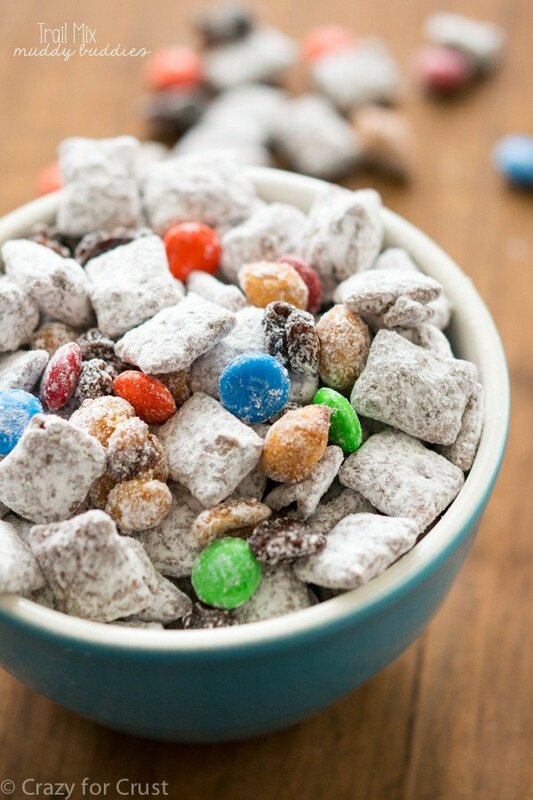 This Halloween Snack Mix has only 3 ingredients and tastes like a candy bar! It’s my favorite snack mix for Halloween! Sometimes I miss not being a food blogger. Before I started blogging I didn’t love lemon desserts, saving me hundreds of thousands of calories each time I went to a party where lemon cake was served. Before I started blogging I thought a basic chocolate chip cookie was the bomb dot com, and I never would have thought to add more calories to brownies by adding crushed cookies, candy, and pretzels. But most of all, what I miss about not blogging is that I used to hate candy corn. I never liked it; I thought it was “too sweet”. I never bought it, never indulged in it. And then somewhere along the way I read a blog post about how when you eat candy corn with peanuts it tastes like a chewy peanut candy bar. From that moment until infinity, I have been lost in the “lover of candy corn” camp. Now, not only am I sharing this infinite wisdom with you (because I want everyone to be as in love with it as me, obvi) but I’m also adding something else to the mix, something that makes the peanuts-and-candy-corn combo even better: Rice Krispies Treats. 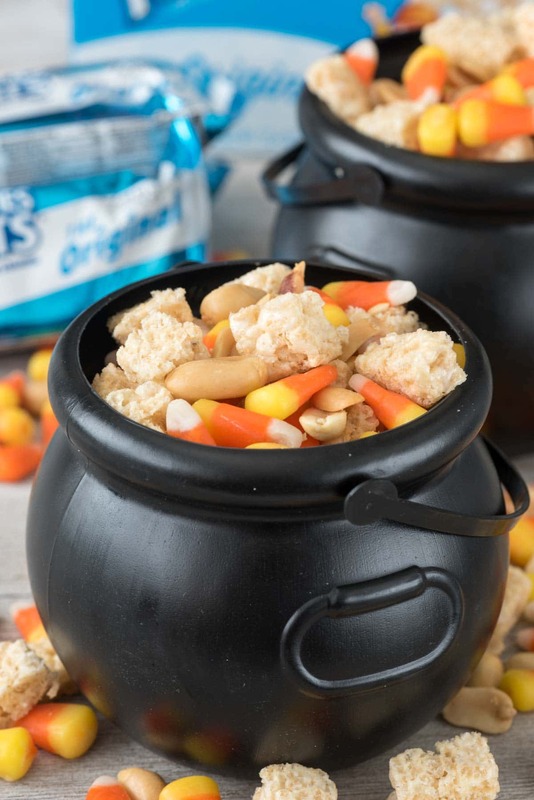 If you add some chopped up Rice Krispies Treats to the Halloween Snack Mix that is my downfall, you get something EVEN BETTER. The chewy sweet texture of the treats just makes it taste like a crunchy chewy version of that same candy bar. This recipe is so easy – only 3 ingredients – and involves no cooking or baking. Basically you need a bowl and you’re done. The hardest thing you have to do is unwrap Rice Krispies Treats! Another thing I love about this snack mix is that you can make as much as you need (maybe for your Halloween party?) or as little as you want (because you KNOW you’re going to want to eat this while you binge all your TV shows). Chop, mix, eat – easy as store bought Rice Krispies Treats! I can’t wait to divide this up into mini cauldrons for my daughter and her friends. They’re going to love it! 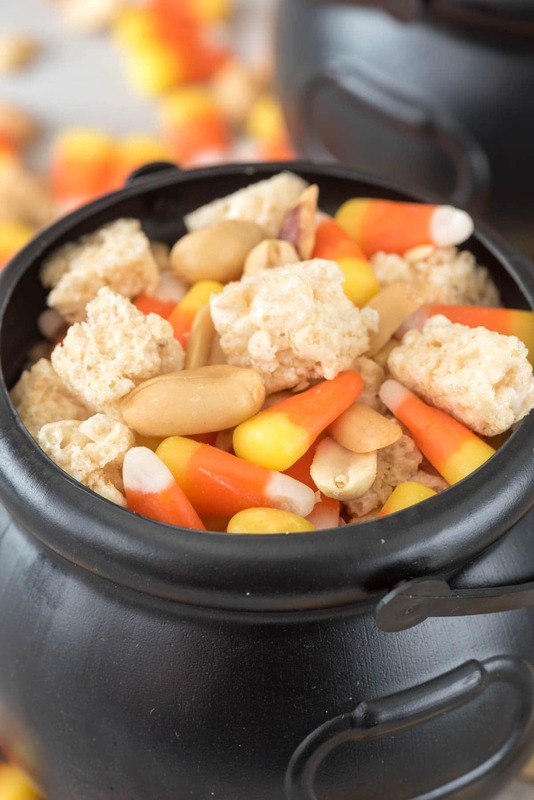 This Halloween Snack Mix has only 3 ingredients and tastes like a Payday Candy Bar! It's my favorite snack mix for Halloween! Mix the candy corn and peanuts in a serving bowl. 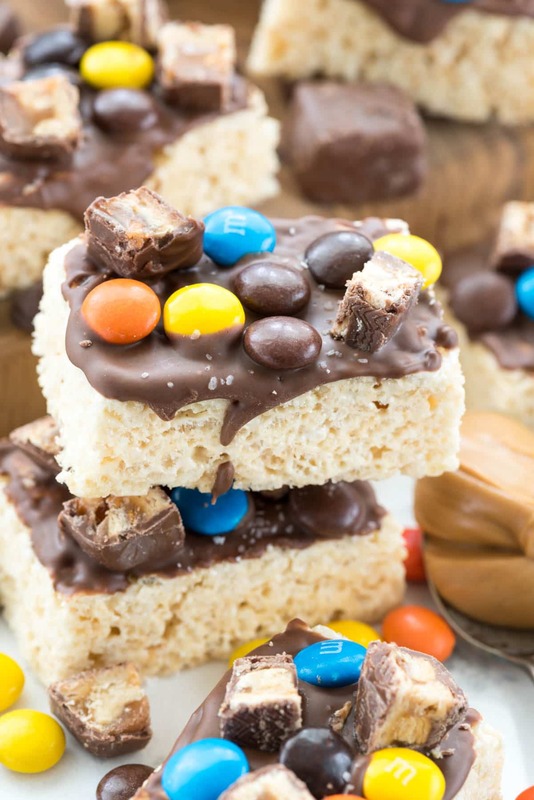 Slice each Rice Krispies Treat into 24 pieces. Mix into candy corn mixture. Serve. This post has been sponsored by Kellogg’s Rice Krispies Treats. All opinions are 100% my own. I totally hear ya. I miss the days of having no real treats in the house. Now I feel angry if I somehow run out of tricked-out dessert. Speaking of bomb dot com, this is what your snack mix here is. It’s perfect!! Oh a three ingredient snack mix? Count me in! This looks so addicting, Dorothy! Love the rice krispie treats in here! 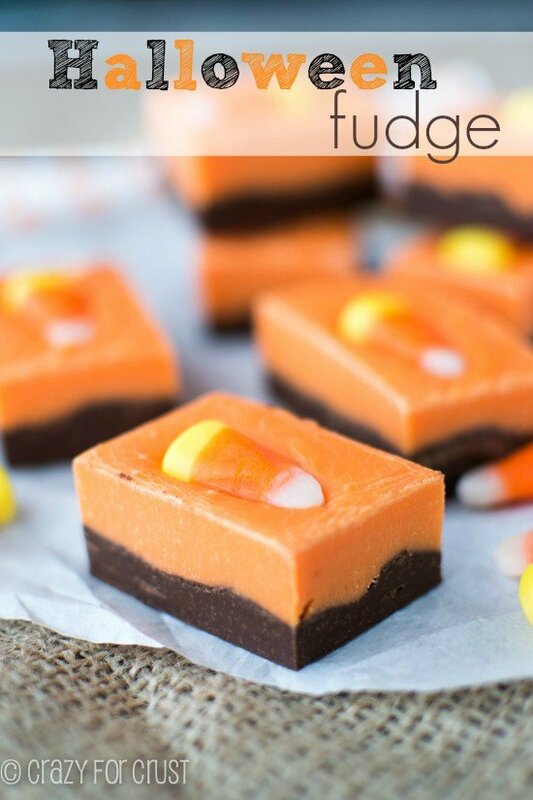 Genius use of RKTreats! And yes the peanuts/candycorn trick. I learned about that one back in the early days of blogging too and yes it swayed me from meh about candy corn to always a fan. You know what else I’ve never thought to use candy corn for…that bonking feeling at about mile 10 of a marathon when I normally eat Swedish Fish. Next race I’m also bringing candy corn…tastes WAY better than gel shots! How cute for any Halloween festivities ( or just the season!). You are so clever! YES. My advice: run far away. LOL! This is brilliant, and it’s certainly party-friendly food if I’ve ever seen it!! I’ve never used chopped up Rice Krispy treats in a snack mix like this before. I’m so loving this idea! I worked in childcare for 20 years or so but oh snap, crackle & pop that candy corn snack mix! I’m a huge fan of candy corn. Wayyyyyy back in the day we would bite each later then get to the white part and fake we broke a tooth. Super funny when your 8! Oh I’m also a huge fan of those little candy pumpkins…. ?